The traffic jam logic game. Escape! 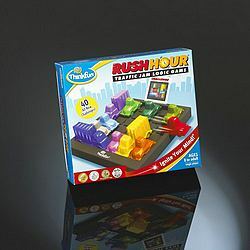 That\'s your goal.Rush Hour is the premier sliding block game which challenges beginners and experts alike. Select a challenge card and place the cars and trucks on the traffic grid as indicated. Get your Red car through the exit. Slide the blocking cars and trucks out of your way until the path is clear.